Life with Lucy, David and Vivian: Any advice on things to do with a toddler in . . .
Any advice on things to do with a toddler in . 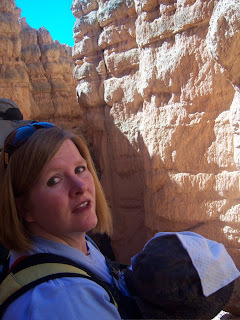 . .
Bryce Canyon? This was my question to the lady at our hotel. Her response was, "No. People don't really bring toddlers here". After her response, I didn't dare tell her we also had a 3 month old! 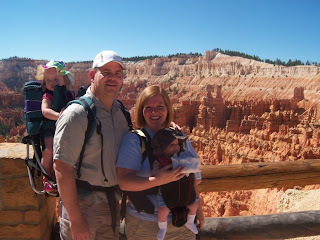 At any rate, we still found LOTS of wonderful things to do as a family in Bryce. 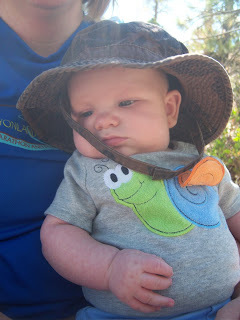 David was a great little hiker. 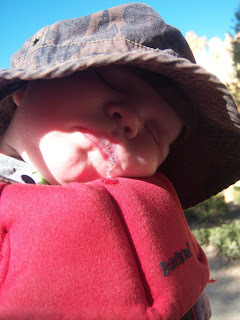 He'd go right to sleep as soon as he was in the Bjorn and I'd start walking. 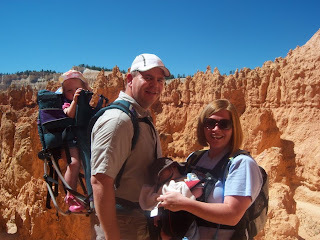 There are many foreigners in Bryce and they all loved to look at our cute baby. One of our favorite hikes ended in a waterfall. We all took our shoes off and played in the water. The water was cold so David just dipped his feet and wanted out immediately! This was David's preferred method of hiking. Can you believe we each have a kid attached to us in this picture? The whole trip was so much fun. 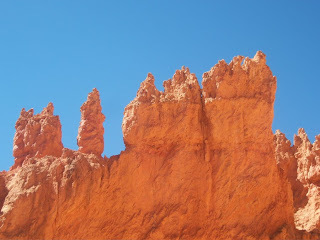 We hiked "Wall Street" from The Navajo Loop which is a VERY steep set of switch backs down through the red rock and hoo-doos. Below is the face Marc caught of me as I realized we were about to hike down . . . THIS! With two babies. The down part really didn't concern me as much as the UP part did. Here we are at the bottom in a bit of slot canyon. It was heaven. And we made it to the top! I was pleasantly surprised at how well we all did. Oh and the weather was great too, 80 degrees! 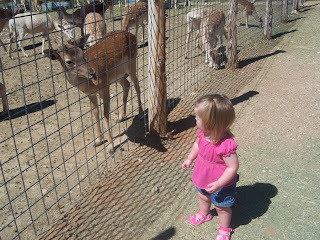 There was a random museum of animals that Lucy loved and right outside of it you could feed some "exotic deer". 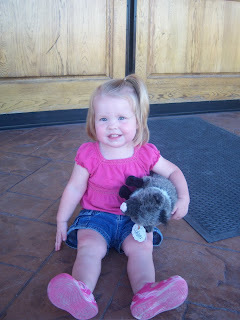 I let Lucy pick any stuffed animal she wanted to at the gift shop (there were cute beavers, bears, raccoons) and she was dead set on having the wild pig!!! It was pretty funny. She loves that ugly thing. And for your viewing enjoyment. 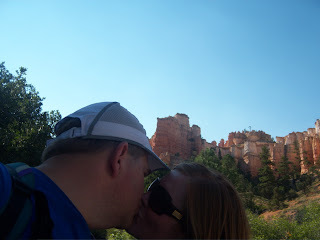 I really love Utah! 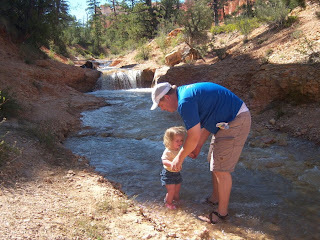 Maybe I'm naive, but it seems like a lot of people would bring their kids to nature with them. 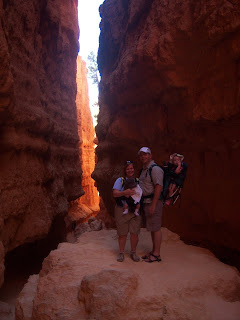 You ought to write a pamphlet on what you can do with toddlers in Bryce and leave it with that lady. Hooray! You got your adventure on with two kids! I'm so proud of you guys! Ha ha ha! That is hillarious! 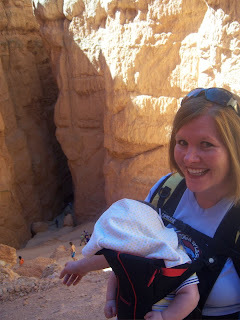 We took Tori to Bryce, Zions and the Grand Canyon when she was 6 weeks old! Everyone was gaga over her...the hikes were a little nuts just having a c-section (I was a little out of shape) and our weather was toasty! I just wished we got her a little passport book!